Orléans is on the banks of the mighty and slow-flowing Loire River, the longest river in France. 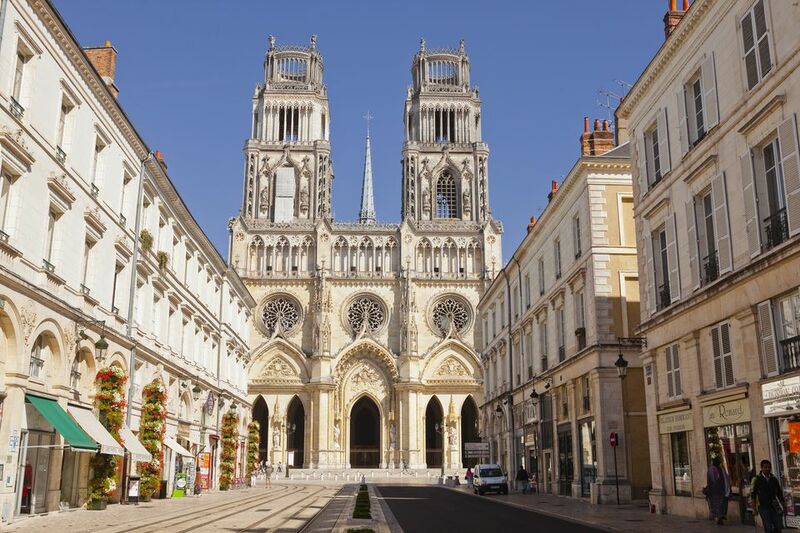 In the Loiret region (45), Orléans is best known as the city of Joan of Arc. It's a less well-known city than many others in this UNESCO World Heritage Site such as Blois to the southwest or Bourges to the southeast of the Loire Valley, but it's a prosperous place with a charming old part and a magnificent cathedral, which is beautifully illuminated at night. Also worth checking out is the Parc Floral de la Source du Loiret, an extensive garden designed around the source of the Loiret river. Orleans is a real gateway to much of the Loire Valley, whether you're going east down to Gien, Cosne, and Nevers or west down the better-known part, past the great châteaux of Chambord, Blois, and Amboise where Leonardo da Vinci spent his last years and on to Tours. Also worth visiting are the very different gardens that you'll find all through the Loire Valley. This is a rich and fertile area, spacious and gracious. Some of the gardens are attached to the grand châteaux; others are more secluded. The great gardens run from Ainay-le-Vieil in the eastern Loire to Villandry in the west. Also well worth visiting each year is the famous Garden Festival at Chaumont-sur-Loire, France's smaller and different answer to London's Chelsea Flower Show. Finally, the Loire Valley is a good place to visit in winter. Some of the châteaux are open all year round and many of the towns hold good Christmas markets running from the end of November to the New Year. Direct Intercity trains run from Paris to Orléans, leaving from Gare d’Austerlitz, 55 quai d'Austerlitz, Paris 13. There are frequent trains taking from 1hr 10 mins. For buses, see the Paris Bus Map to plan ahead. From Charles de Gaulle Airport the easiest and fastest route goes via Tours taking 3 hrs 50 mins. Popular direct connections with Orléans include Blois in the Loire Valley, Bourges, Tours, Argenton, and Vierzon. Orléans Station is on place d’Arc opposite a modern shopping center, just a few minutes over busy roads from the old center. The distance from Paris to Orléans is 133 km (82 miles), and the journey takes around 1 hr 40 mins depending on your speed. There are tolls on the Autoroutes. By bus/coach Eurolines offers a cheap service from London, Gillingham, Canterbury, Folkestone, and Dover to Paris Charles de Gaulle Airport and Paris Gallieni. Six coaches a day; 2 overnight; journey time is 7 hours. The Eurolines stop is at the Paris Gallieni Coach Station, 28 ave du General de Gaulle, just by the Gallieni metro station near the Porte de Bagnolet (Metro line 3, final stop). IDBus also operates between London and Lille and London and Paris. IDBus also goes from Lille to Amsterdam and Brussels.